Mondays & Thursdays at 9:30 a.m. Stories, songs and themed activities. No registration required. Pancakes on a plate, carrots in a bucket, leaves falling all around… Family Storytime makes learning exciting. 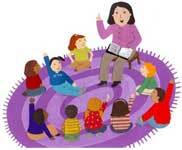 Children’s senses are fully engaged by being read to, moving to music and participating in a group activity. On a recent Thursday morning, kids lined up around Ms. Cathy’s bright red pail and “harvested” real carrots from below the dirt. A paper carrot craft rounded out the morning. These activities turn storytime into a memorable experience for parents and kids. When you make storytime a weekly priority, you’re modeling the importance of learning and showing your children how much you like reading too! Each storytime is designed to incorporate pre-literacy skills with delightful children’s books to encourage children’s early love of reading. Here are some tips for making this time happy storytime experience for all.